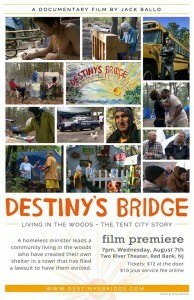 Right off the top of my frontal lobe, I need to say that this amazing documentary by filmmaker Jack Ballo, ‘Destiny’s Bridge,’ where he spent a year of his life recording the lives of the homeless in Lakewood, is having its world premiere at Two River Theater in Red Bank, New Jersey on August 7th. Journeys to sensitivity and understanding sometimes begin innocently with little fanfare and symphonies. On Easter Sunday 2012, I attended a concert of awareness for the people of Tent City in Lakewood passionately put together by Rosemary Conte. With my son, we filmed the event for NJ Discover. 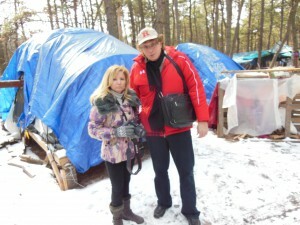 I had no concept of what Tent City was and the fact that around 100 humans were living in tents for years without electricity, heat or basic amenities because Ocean County has no shelters for the homeless. Tent City was 24 minutes from where I’ve lived for 24 years but that didn’t register in my frontal lobe. While listening to the music close to the staging area, a bus of Tent City residents arrived at the far end of the plaza for food and clothing donations. Minister Stephen Brigham brought the tent residents in his yellow school bus; that scene was still far away from me in several ways. I stayed with my son but saw people holding empty plates waiting on a food line. An image of President Herbert Hoover’s Great Depression flashed across my unsympathetic retina. Close to the musicians I remained. It seemed the thing to do. When I got home that night, I forgot about the hungry homeless and talked to my family about the special Jersey musicians I heard for the first time. Cut to January. 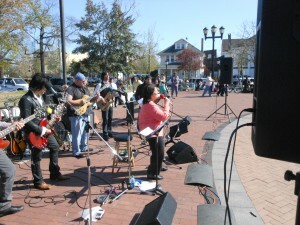 Hurricane Sandy relief concerts were happening all over the Garden State. My past written words of support and admiration for Rosemary Conte and her wondrous musical and life contributions caught up to her; we became friends. She invited me to cover a Sandy benefit concert at McCloone’s in Asbury Park for NJ Discover. I interviewed her and then came an introduction to Sherry Rubel, concert organizer, photographer extraordinaire and Tent City activist. 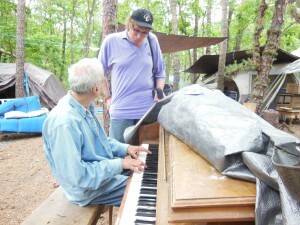 with Michael as he wondrously plays the piano in front of his tent. I’m not a Siskel or Ebert. On the other hand, I have evolved over my tech noir years of ‘Casablanca,’ ‘From Here to Eternity,’ ‘On the Waterfront;’ where perhaps I’m now a contender to talk about movies. Part of the evolution side effect is a bit of snobbish attitude to viewing movies; can’t waste time watching ineptitude in film making and storytelling. Movie making is an art form and a great gift. The works of quintessential movie makers fascinate me. I’ll notice eye-brows moving and the wispy windy sounds of a tree next to a window as two characters are staring at the moon. I take it all in; pure cinematic absorption. I need to learn, emote and feel. Looking back, motion pictures have helped congeal my views of the world and changed my life. Watching ‘Casablanca’ for the 44th time some years ago formed the basis of my first novel. So when I previewed the movie ‘Destiny’s Bridge’ a few weeks ago, I found myself instantly riveted into the world of Tent City. My emotional ties developed quickly with the residents; sensitive caring humans looking for dignity and respect in a cold world. Jack Ballo seamlessly weaves their stories and interconnectivity of existence; how they depend on one another. I can say it was beautiful film making; vivid photography heightened the stark reality. 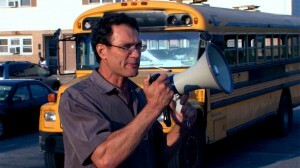 You will learn about the harsh human condition of homelessness from this documentary. Yes, it is an exquisite film which means sensitive, emotional, real and poignant. Back to my being a snob about movies; I’ve since watched it again. You may need to do the same; the film delivers a powerful message about homelessness and Minister Stephen Brigham’s vision for a future. Then Jack Ballo’s treatise on the lives of some of the people; you grow fond and bond with them, maybe wanting to reach out and help. You care about their lives. The film is beautiful because it makes you feel something inside. It evokes. I love when I’m evoked to emote by a film. It was a painstaking meticulous project for Ballo; a year of his life for the desire to make a difference. I look at myself right now at this point in time somewhere in a universe. ‘Destiny’s Bridge’ has innervated and moved me; therefore a brilliant work. There’s sadness in the final scene looking down from high above; in some ways leaving that homeless world below but also heralding an awareness that much needs to be done. All my above criteria for good movie making have been met; I call it a contender. Here’s thanking and looking at you Jack Ballo. ORDER TICKETS HERE ON LINE!! REALLY ALMOST SOLD OUT!! Advance online tickets for the film premiere of Destiny’s Bridge are nearly sold out!! Best you order yours before the end of today. ($12 at the door) Wed. Aug. 7, 7p.m., Two River Theater, Red Bank. So much art & culture for such a low price!! 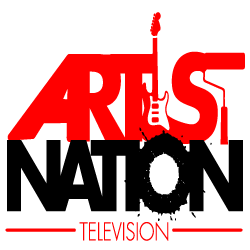 8:20 – Q & A; Introduction to the audience to filmmaker Jack Ballo, Univision Films; Minister Steve Brigham, and residents of Tent City featured in the film. Emcee is Dr. Michael Paul Thomas, Monmouth University. 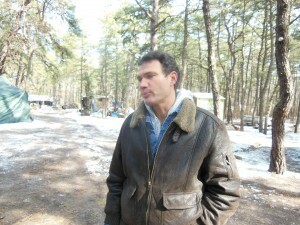 8:45 – Reception, wine & cheese, piano music by Michael, a Tent City resident. Photos for all on the Red Carpet. The tickets can only be purchased online! 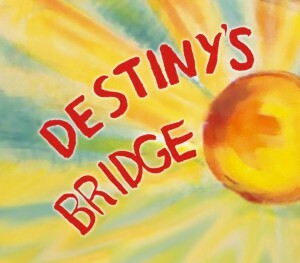 Go to http://DestinysBridge.com for more info. How did a filmmaker’s first full-length documentary get sold out at a prestigious theatre many miles from the story’s locale? Because this human drama is not confined to the locale where it was filmed; this story is about the plight of homeless people in Lakewood, NJ’s `Tent City’, and their hopes of creating an affordable community for people who might otherwise be homeless – but there are hundreds of similar encampments of otherwise homeless people throughout America, and hundreds of thousands of homeless people in this most prosperous of nations. How do an independent filmmaker, a homeless minister, and a university professor expand and motivate a team of volunteers to successfully pull together all the elements necessary to a successful film premiere? Because when the chips are down and the cause is just, people rise to the occasion. Why is there a greater need than ever for communities such as the proposed Destiny’s Bridge? Because ever greater numbers of people are being driven into poverty and homelessness, and because in hundreds of cities and towns across this land, homeless people get a swift kick while they’re down, in the form of a ticket often leading to arrest and jail time. It’s called the `criminalization of homelessness’: morally and legally bankrupt laws and ordinances prohibiting people from sleeping anywhere in public including park benches, sitting to rest on a curb or pavement, or accepting food in public – in this last case, there is actually a `criminalization of charity’ – because charitable individuals face harassment, steep fines, and detention for simply giving food freely to groups of hungry people in public. Other than out of moral outrage, why should you take action? Because the `criminalization of homelessness’ is an extreme version of the spreading `criminalization of poverty’ – and ultimately this is leading toward disenfranchisement of the non-wealthy, which is nearly all of us. The Destiny’s Bridge world premiere played to a packed house – the film, Q&A session, and other events of the evening were all a smashing success! 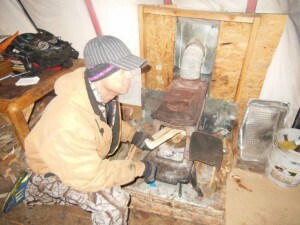 Cal…Your superbly written article could win an award! Thank you for saying so beautifully all the important things that need to be said about Tent City, the residents and the Jack Ballo film. I will always remember the strange and lovely universal vibes that brought you, me, Sherry and Tent City together. Thanks for everything.